Description: Given the name, you might assume that the Echinacea Project studies only one species. While it is our main focus, we have introduced other focal species into our mix of experiments, such as… STIPA or Hesperostipa spartea, to be exact. A GRASS; a really cool, cool-season grass! Postdoc Caroline Ridley’s legacy includes the design of the Stipa Project — studying the effects of habitat fragmentation on the ecology and evolution of Stipa. In this experiment we GPS’ed and collected seeds from individual Stipa plants in remnant populations within Solem Township. 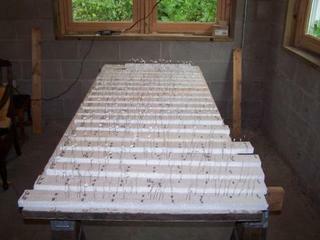 Careful to keep their awns from twisting together, we poked each seed, affixed with an id label, onto foam trays destined for planting in exPt 1. We planted two cohorts of Stipa seed, 2009 & 2010: over 4,000 seeds total! We’ve been put to the test trying to find our Stipa plants in a matrix of other grasses, but once they flower they are easy to spot. 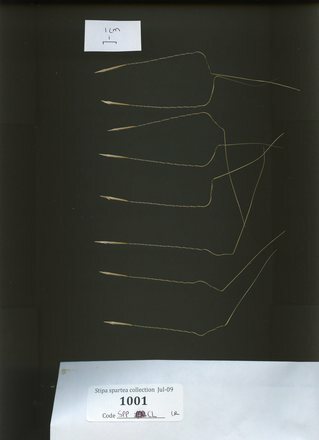 Scan of Stipa seeds; notice the long awns! Products: Former team member Josh Drizin wrote his MS thesis on the hygroscopicity of Indian grass and Big bluestem. He also posted an awesome video of the twisting awns of Stipa on YouTube. 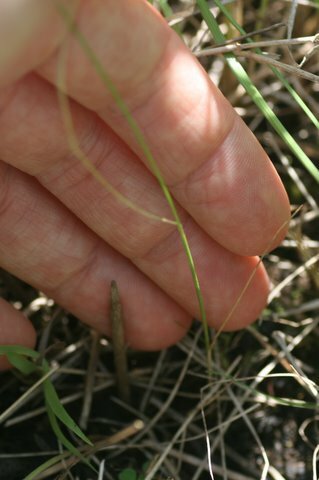 Link to flog posts: Read updates about this Stipa experiment on our flog (field blog) as written by members of Team Echinacea.